Eddie has a number of other watches coming on line this year, so it may be some time before these become available. Mores the pity. 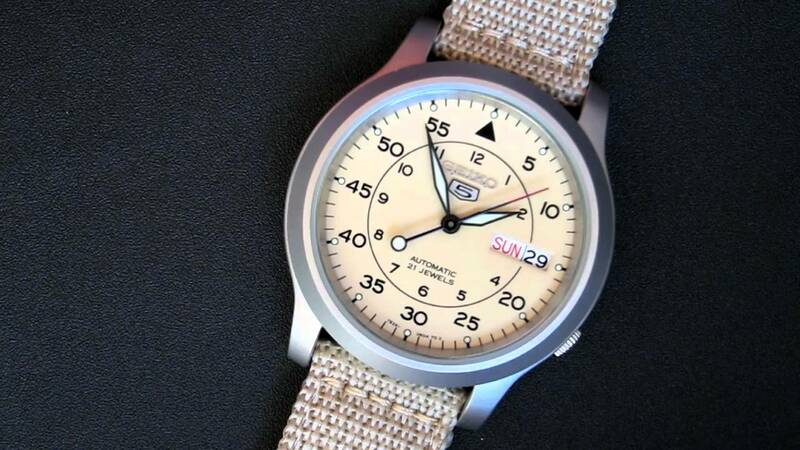 I'm really not a fan of Version C. It just reminds me of a cheapo Seiko SNK803. On a more positive note, I received my 36mm PRS-25 last week and I love it. Glad you posted that. ??? They look nothing alike. Even if they did, I buy watches for more than aesthetics. Otherwise I should probably send rolex an email telling them to stop producing subs because I can buy something with a mercades hand for a fiver. It's my opinion to which I'm entitled to. Disagree by all means, but there is no need to like that, is there? Apologies. Just having a chuckle. Wasn’t meant in spite at all. Apology most graciously accepted! I must say, that I wasn't expecting passioned responses. It's almost like I'd told a person that their newly born baby is ugly. Of course there are differences between the two watches, but the shade of white used on the dial, the 60 minute track around the outside, the concentric inner ring, the lollypop on the second hand and their very similar size, immediately reminded me of the Seiko. I much prefer dial B.
I reckon a switch to a polar white for dial C would look great. Really fresh and a nice contrast to it's vintage roots. Last edited by DennisK; 20th January 2019 at 23:38. I saw one on facebook a few months back where someone had polished up the bezel with some Cape Cod stuff. Made a cheap watch look much better ! Option B still doing it for me. Would like to see it mocked up with a polar white dial rather than the creamy white. That Seiko 5 looks much better in black but either are not a patch on option C aesthetically imo. Option C looks several pay grades higher in class. Well I really hope you're describing an ivory / off-white face as polar white would rule it out for me. The photos of the Air Ministry suggest off-white or even cream, but you can't be sure until you actually see it in the flesh in different shades of light (and I don't have the 29AM). The question of colour here is purely subjective, of course, so I appreciate others may have totally different views. I have been looking at one of the current Everest 36mm but think I might prefer this. How likely is this to happen? I haven't ordered them yet, cashflow has taken a bit of a beating lately. I think the sapphire domed crystal is also the reason that the watch looks smaller than its 36mm, more like 34mm. Now that the honeymoon phase is starting to wear off I have to say that I really dislike the milky ring effect of the crystal. I wonder if it's possible to replace the sapphire with an acrylic crystal. Guess I'll have to talk to a watchmaker. But if not acrylic, then I would prefer a more contemporary slight doom, so you don't get the milky ring. I apologize if this has already been asked and answered, but why are Timefactors watches moving away from (my beloved) acrylic crystals? I've never heard the term "milky ring" before (well, except in this thread). It sounds more like an astronomical term than anything you'd see on a watch! Perhaps someone can explain exactly what this is meant to describe, or better still post photos demonstrating the effect? I'll say that the 36mm Everest hasn't been off my wrist since December and I have no problem with the sapphire box crystal - and of course the anti-reflective coating on it is excellent. Don't get me wrong, I have no great issues with acrylic crystals and I'd certainly still be up for the pale-faced Everest with an acrylic, but no-one can deny the practical advantages of sapphire. There are arguments in favour of either option for these watches but given the size of the production runs, Eddie can realistically only offer one or the other, not a choice between both. It's the sort of thing you can't stop seeing when you have first noticed it :-) Watch these to videos, and you will see that it is quite a common discussion. I'd never heard of it or noticed it until it was mentioned here. I still don't notice it when wearing the watch, a non-problem IMHO. no-one can deny the practical advantages of sapphire. The 'milky ring' isn't a 'problem', per se, it's just the visual difference between the two that stands out the most. I prefer the look and feel of acrylic crystals. I know I'm not alone. I know others prefer sapphire - I used to, myself. I don't recommend developing a taste for hesalite, today, as it's getting near impossible to find in new watches. I do agree with Magirus, it is not a problem for me too, considering the advantages, at least for me, of sapphire crystal. Thanks for the links and photo - at least I'm clear on the "milky ring" description now! You say you *can* deny the practical advantages of sapphire, but - no offence - nothing you've said even addresses the issue. All you've done is explain your aesthetic preference for acrylic over sapphire. The first video posted a little while ago includes a bit where one chap says how he much prefers to accept the look of an acrylic crystal with scratches picked up in normal use rather than polishing it regularly to remove the scratches. Some of us prefer neither - and a sapphire crystal has the major practical advantage that it is highly scratch resistant. For you, your preference for the look of acrylic may outweigh the scratch resistance offered by sapphire, and that's fine, but that doesn't mean that the difference in scratch resistance doesn't exist. Many people value that aspect highly and not everyone will necessarily have such a strong preference for the look of acrylic. You're right, that's exactly what I've done. No offence taken -- I think you mean "the issue" being sapphire's scratch resistance. I can't deny that sapphire is more scratch-resistant than acrylic. What I can deny is that it's an advantage over an acrylic crystal and a $10 tube of Polywatch and some cotton balls. You can't deny the practical advantage of acrylic being more shatter resistant than sapphire. You can't deny the practical advantage of acrylic being cheaper to replace than sapphire. You can't deny the practical advantage of an acrylic crystal not needing an anti-reflective coating, at all, that some manufacturers still cheap out on (looking at Hamilton). You can deny that any of these outweighs the advantage of having a crystal that you don't have to worry about picking up scratches that you'd have to take a couple minutes to buff out if you had an acrylic crystal. To each his own. No offense -- but it shouldn't surprise you to find people on a watch forum to whom aesthetic preferences are important. No-one can deny the practical advantages of a quartz movement. But aesthetics matter to fools like us. Nonetheless I think a lot of people do value the scratch resistance of sapphire highly, and above the other aspects you've mentioned. Yes, the look of a watch is important, on a watch forum or anywhere else, but coming back to the the PRS-25 36mm I still don't find a problem with the look of the existing sapphire crystal. Eddie can never win really in that if he fits the watch with sapphire he'll lose some customers who strongly prefer acrylic and if he goes with acrylic then the reverse applies! If there were a clear preference emerging from the forum for acrylic and Eddie decided to go down that route for the new version then, as I said before, I'd still very much want one. My guess is that most of those here who are interested wouldn't let the crystal type stop them buying, though obviously I could be wrong .. I prefer acrylic - however, its not a deal breaker for me. Hello everyone and hello Eddie! My name is Ken and this is my first post here on TZ-UK. I decided to register today because I wanted to voice my enthusiasm for version 3 of the proposed white-dialed PRS-25. I think it is a fantastic design you have come up with Eddie, and I think there's a very good chance I'll buy one should it make its way into production. The reason I like version 3 so much is because it pays homage less to the 1016 Explorer and more to the great Smiths exploration watches of the past. For me, that's its biggest strength, and I say this as a committed fan of all things Rolex, and of the 1016 in particular. Smiths is a great company, a great brand, with a great history, with many great original designs, and in my opinion, modern incarnations don't need to lean on the design cues of any other company in order to be successful. That's why the PRS-29 works so well. It's clearly a Smiths watch through and through, an original design that stands apart all on its own. With regards to the '53 Everest expedition, I think it is fair to say that no one alive really knows with 100% certainty what watches were worn on the summit. But I'm fairly sure that if Sir Edmund wore his Rolex, Rolex would have made considerably more of the fact than they did. They would have been far, far more unequivocal in their advertisements. With Smiths, they were nothing but unequivocal because they had the benefit of something Sir Edmund actually wrote on the matter: "I carried your watch to the summit". Yes, his words imply that his watch was stored in a pocket or in his backpack somewhere, rather than strapped to his wrist, but that's enough for me. Based solely on that testimony I'd go so far as to say, if you're going to produce a modern Smiths watch that pays tribute to the '53 expedition, why include design elements from Rolex at all, especially from the 1016 which we know with certainty played no role whatsoever? The '53 British expedition was easily Smiths single greatest historical claim to fame, so why not produce something that echos the Smiths De Luxe on display at Guildhall and just leave it at that? I mean, let's face it, buying an original A404/409 is becoming harder and harder these days, and even if you do find one, it's a small watch by contemporary standards, the movement lacks modern shock-absorption, and it will almost certainly show signs of severe wearthrough in its chrome plating. But their use in the Himalayas and Antarctica and other places makes them hugely desirable watches that deserve every bit of enthusiasm from collectors that their prices suggest. And since we're talking about removing 1016 design elements altogether, why not make the white-dialed PRS-25 a sub-seconds watch like the A404/409? Just as with the PRS-35, it would be a design that would stand on its own, as a Smiths watch and only a Smiths watch, and properly done, I would argue it would be more commercially successful as a result, not less. As I said, this is my first post here, and I know that I'm running the risk of sounding like I'm telling you, Eddie, how to run your company as much as how to improve the design of the PRS-25. But the truth is, as much as I love Rolex, I love Smiths, and I really think you have an opportunity here to produce something really great, something lasting, something truly unique and original, a Smiths watch that is unashamedly Smiths. And how better to honour the legacy of this great company and its involvement in one of history's great adventures? Thank you for bearing with me and thank you, Eddie, for keeping the Smiths name alive. Whether you choose to take my suggestions on board or not, you have done a fantastic job with the PRS-25, and all your watches, and I wish you nothing but the very best. Great first post, not only because it's the longest one I've ever seen ;-) but mainly because it's stuffed full of opinions argued with some enthusiasm. Just what I like to read! I do see the advantage in scratch resistance, but then go with a flat og just a slightly curved crystal - sapphire only gets the milky ring, if you try to give et at huge dome in an attempt to make it look like the acrylic. I cede all of your points, sir. I'd be very surprised if there were more desire for acrylic than sapphire -- if only because nearly every luxury watch model uses sapphire glass. Bless my Speedmaster and long may it live. Personally I prefer sapphire versus acrylic. I've frequently used acrylic over sapphire but for many, acrylic is a deal-breaker. The number of times people have said "I love the watch but acrylic is a deal-breaker for me" must he hundreds, if not thousands. I've also frequently been asked if I can supply a sapphire upgrade (yes, people do regard sapphire as an upgrade). I can't recall anyone saying "sapphire is a deal-breaker for me". I loved the acrylic on the first batch of PRS-25 - looked like a jewel, and really made the watch. I do see, that you can't make all the watches with sapphire, but perhaps just the white dial. Or I would suggest less of a dome, like on the speedbird models. Any how I do understand, that most people do want sapphire. It is a deal-breaker to me, when the sapphire is domed the extent that you get the milky ring, it really ruins the look of a watch. Thanks a lot for your replay - the white dial PRS-25 looks stunning. Dammit, you got me hooked on acrylic crystals in the first place! Sure, I used to be a "I must have sapphire!" guy, until I bought a PRS-6 and stopped being a spec-obsessed philistine. I love all kinds of watches, and I can't think of any characteristic I'd claim is a "deal killer." But I am sad that I have to look elsewhere to sate my appetite for plexiglass. White No 3 for me, will watch with great interest and open wallet when they are released. How hard / easy is to "downgrade" from a sapphire to acrylic? I can change a strap and even take the back off to regulate the movement but presumably any competent watchmaker could swap out the sapphire for a bit of plastic? If so, better to buy the watch with the sapphire if that, as Eddie says, is what people want and even consider a deal-breaker. Then just remove it, pop it in a bag for safekeeping (in case, heaven forbid, you should ever sell the watch) and insert the plexi of your choice. I'm currently test-driving the 36mm Everest for a review and am ambivalent about the sapphire. There are definite pros and cons and I can see both sides of the glass (ha ha) however I do like the plexi on vintage watches (including the 1016 Explorer) and I think Zeno used that in their homage, too (although unlike Eddie they got the case horribly wrong, not something you can easily swap ha ha). I would love this "Antarctic" Smiths to get a plexi as I own several (!!) Smiths De Luxes from the 1950s and that's what they have. So if swapping it is easy then that's what I'll likely do. Probably having done so I'll swap it back and replace it but I'd be interested to try it both ways. I don't think it's as easy as that - the watch is constructed for at specific type of glass. (I could be wrong). The acrylic high domed glass with the nice distortions used in the Rolex Explorer 1016 and the Speedmaster and most vintage watches. Current vintage-look watches made with the acrylic high domed crystal are Baltic, Merci LMM, Lorier Falcon, Seagull 1963 etc. Then there is the flat or low domed glas used in the modern Rolex Explorer and most other modern watches. Sapphire coated high domed mineral glass - used by Dan Henry and Undone. Sapphire coated high domed acrylic glass - used in Junghans Max Bill. Last edited by Mads Gorm; 17th February 2019 at 12:57. The number of times people have said "I love the watch but acrylic is a deal-breaker for me" must he hundreds, if not thousands. I've also frequently been asked if I can supply a sapphire upgrade (yes, people do regard sapphire as an upgrade). My guess is that folks like me, who for better looks are willing to suffer through a little work in buffing out scratches of acrylic now and then, we're just a little more tolerant, looking at the bright side of things. "Meh, sapphire, but at least it doesn't scratch". Eddie could you offer acrylic and sapphire as options but at the same price? That way aficionados can pay “more” for their authentic plexiglass and you’d cover any costs caused by the extra work of offering two options. I’d take the plastic on this one. Looking at one of the above links I see that there is a marked difference in the thickness of plexi and sapphire at the edge of the crystal - doesn't this mean that the case design will need to be different for each? Yes, watch case design is different if it is mounting plexi or sapphire. In which case I think that it is highly unlikely that a plexi version will be an option either new or as a mod. Acrylic-lovers will still buy it with sapphire but less so the other way round. It's shame as this particular model would look just right with the original spec crystal.